As part of our tireless efforts to demonstrate the many ways Zombie Simpsons fails to entertain, Season 23 will be subjected to the kind of rigorous examination that can only be produced by people typing short messages at one another. More dedicated or modern individuals might use Twitter for this, but that’s got graphics and short links and little windows that pop up when you put your cursor over things. The only kind of on-line communications we like are the kind that could once be done at 2400 baud. So disable your call waiting, plug in your modem, and join us for another year of Crazy Noises. This text has been edited for clarity and spelling (especially on “bicuspid”). I mention this briefly below, and I’ve brought it up a couple of times before, but another one of those recurring annoyances about Zombie Simpsons is the way they deal with modern technology. Like it or not, it’s a lot easier to communicate from just about any location than it used to be. This poses a lot of problems for screenwriters for the simple reason that it’s harder to have characters be either isolated or misinformed. (If Romeo and Juliet had been able to text they’d have been fine.) Zombie Simpsons, in its infinite apathy for things making sense even for just a few seconds, takes this to new lows by having the characters alternately be perfectly informed, and then suddenly forget that they’re carrying a cell phone. This happens in a particularly galling way at the end of “The Food Wife” when Marge sends Homer to the wrong side of town. That Homer wouldn’t think to check the address doesn’t bother me. What bothers me is that Marge gives him the wrong directions and then neither of them has a cell phone right up until the plot needs them to have a cell phone, at which point she gets a panicked message and knows to go teleporting herself to the meth lab. Either they’ve got cell phones and there was never a chance her plan was going to work (because he’d be able to reach her once he knew he wasn’t at the restaurant), or they don’t have cell phones and her plan to ditch him might work (because he won’t be able to reach her). Only on Zombie Simpsons can it be both. Charlie Sweatpants: Ready to get started? Dave: Yep. I want that 21 minutes of my life back. Charlie Sweatpants: But this wasn’t really it, was it? Dave: Exactly. In the clumsy hands of the animators and writers they just made unbearably not that. Charlie Sweatpants: I could do with the Tim and Eric song. It wasn’t a standout piece by their standards, but it was good. The rest of it was pretty lame. Charlie Sweatpants: I’m also struggling to come up with a way this wasn’t an episode of Family Guy, but I can’t quite do it. Everything from Homer screaming and crying to zooming in to show Marge’s tastebuds felt very MacFarlane. Charlie Sweatpants: Oh yeah, you knew that was making a comeback. As soon as I saw that, the first thing I thought was "Bicuspid, we meet again!". Charlie Sweatpants: More generally, there were a few decent toss off jokes here, but this episode needed a B-plot badly. In comments someone mentioned that Matt Selman took to Twitter and said they had to cut a bunch of stuff for time, but if that’s true then they need to get a new editor. You could’ve saved a minute or more by reducing the number of times Marge whined about not being fun from a hundred to a mere fifty. The story here is just desperately thin, and they bash us in the face with it over and over again. Dave: I’m not sure they could’ve driven the point home only doing it fifty. But that’s just me and my general lack of perception and need for hand holding. Charlie Sweatpants: Yeah. I mean, the dream sequence? You couldn’t trim that hobo parade to a lean twenty? She’s jealous of Homer. We. Get. It. And while I’m making comparisons, is it just me or was this about 1/100th as rough on the celebrity chefs as South Park was a couple of years ago? Celebrity chefs are ripe for parody, but Zombie Simpsons just brings them on to fellate them and piggyback off their popularity. That was also the episode that gave us Shake Weight. Whatever was on last night didn’t come close. Charlie Sweatpants: No it didn’t. But it did involve a gunfight, a flaming meth lab, and a Springfield that resembles the nicer parts of Los Angeles more and more all the time. That’s what this basically was: The Simpsons are going to Santa Monica! Dave: They were overdue for another schtick-y travel episode, weren’t they? Charlie Sweatpants: It was about time, yeah. Dave: I think what bothers me more than anything is the lack of subtlety. At E4 or whatever the hell it was, they weren’t comfortable leaving the parody game titles in the background as they once may have been. Instead we have Bart rattling off virtually every sign, one by one, effectively as a show of contempt for the audience. Charlie Sweatpants: The video game stuff was so weak I almost felt bad for them. Here’s Homer in a first person shooter being a jerk. Here’s Lisa telling us dumb marching band stuff. Here’s Angry Birds! It feels transparently like they’re trying to get people to say nice things about them on-line, like when you get a cat picture e-mail from your elderly relatives. Charlie Sweatpants: And once that ran out of steam, they were left with that one note story and a lot of celebrity voices. Dave: In other words, everything we’ve come to expect from the show these days. d) scenes that make no sense, like having Sideshow Mel and Comic Book Guy just start eating with them. We don’t talk about that one as much, but this episode has it in spades. Homer gets to the meth lab and thinks it’s a restaurant. Whatever. But then, when he’s in danger, suddenly he has a cell phone, which he didn’t use earlier. Charlie Sweatpants: There were a couple of scenes, like Homer and Marge talking in the bathroom and at the amusement park, that stood out as lifelessly animated. I think it’s the straightness of the lines. The backgrounds look like an example drawing in Photoshop or something. Dave: You can be crisp without being crappy. Charlie Sweatpants: Again, agreed. Anything else here? I don’t think there’s much left. Lots of internet friendly stabs at humor, but overall the whole thing is weak and shoddy. Oh, and the best part was done for them by someone else. Dave: That’s a solid recap. Charlie Sweatpants: Thanks. Too bad it was a mushy episode. When’s the last time a celebrity appeared on the Simpsons with circular eyes? Does it not emphasize how much celebrity cameos are trumped up as something big? I kinda feel sad for that guy who was the spokesperson for the Simpsons at comic-con and the only thing the could say was what celebrities are guest-starring. Surely there’s been a post about this visual difference, right? I’m surprised you didn’t mention that neither Tim and Eric’s characters were given names or explanations for being there. They are foodies, presumably, but why do they end up in the Simpsons’ house? Did they become friends? Nobody seemed to talk to them, really…they just showed up wherever the Simpsons were. And why did they not have names? It was so bizarre. Maybe that’s some of the five minutes that was cut. Good point. There’s a lot wrong with these episodes if you happen to have standards. I’ve heard before that comedians will lose their edge when they become further and further removed from everyday life, because how can you comment on everyday life when you don’t experience it? The Simpsons flourished as a TV show because the writers hit all the right notes in how people of their means live day-to-day. However, they’re so far removed from living life like the Simpsons that they have no idea how to write it anymore. How can you write upper-lower-middle class stories when you haven’t been upper-lower-middle class (not to mention living somewhere other than Hollywood) in over 20 years? It’s ironic how in the golden years of the show, when the family was written much more believably as an average American family, most of the writers were Ivy League eggheads (as I think they still are today). I guess you’re right that the insular culture of rich white Angelenos has detrimentally impacted the stories & characters, not to mention the changes in the writing process as written in the Ortved book. I would love to see some Compare-and-Contrasts on the quality of animation in these new episodes, I still can’t get over how crappy the show looks in HD. Every single character looks like the animator copied directly from the character model sheet, with absolutely no off-model in-betweens. I second the need for an in-depth post about the change in animation. Perhaps it’s time for another one. 1. The lines in modern FOX cartoons are so thin all you see are bright shapes of color. The simpsons was never big on smooth ink but the grittiness of the lines helped sell the idea of a lower-middle-class family. 2. Straight or stock-bent limbs. What really irritates me about American Dad is how straight everybody’s arms and legs are. It has no respect to the natural slouched, tense, curvy nature of people. 3. How though the show is so obviously computer-generated, they still have gaps in the outlines programmed into the background. That’s taking what used to be unavoidable mistakes when painting backgrounds became a background quirk, but it’s insulting now. You know at this point I realize I’m just bitching, but it’s expected that over time, a show’s animators will get set in routine and do less and less creative things with the animation. Whether it’s by a lack of effort, pressure from corporate or pressure from Matt (never likes off-model) Groening. I just wish there was an effort to return or at least artificially implement the flaws of cel animation. No off-model means no surprises or expression beyond the stock. 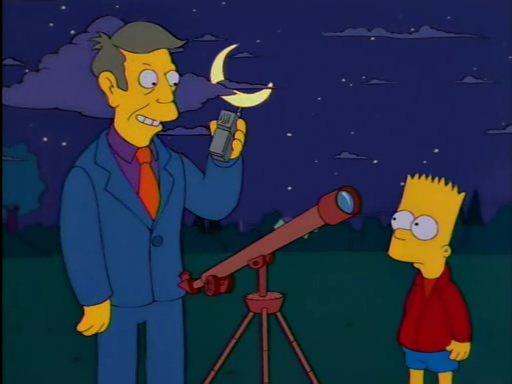 If you watch as Skinner says this, clouds black out the moon and as soon as he finishes the moon reappears, always thought it was a nice touch. Oh man. That’s why old Skinner is my favorite character… his dark side. Like all those early episodes with the Nam flashbacks, the random yelling, the creepy reflection of the window blinds on his face, him staring creepily at his own house… classic. Best part of this write up is “If Romeo and Juliet had been able to text they’d have been fine.” Hilarious, and sad. It’s like, the only thing interesting that will appear on television/movies anymore have to be pre-cell phone or at least focus on poor people. In making everything so convenient for the world — everything you’ve ever wanted to know/see/read/hear is a click away, even on a phone — it’s taken out a lot of the humor of everyday existence, especially when 10-year-olds have cellphones. The Simpsons is odd because it changes with the times technologically, occasionally… rather, convenientally.. yet, they still feel like late 80’s/early 90’s characters who just happen to have 2011-ish technology. Which feels odd. Very odd, and not in a funny way, but a confused and creepy way. If they’re so intent on having the characters never age, never really progress in any meaningful way in their behaviour (y’know, “develop”), then why are they trying to make them so “current” with all their gadgets? This show was the best when it didn’t pay attention to what everyone else was doing, and while I didn’t mind this episode as much as a lot of people (it actually had a plot and actually followed it through, despite it being flimsy and scattershot and kinda boring), you guys were right on by saying it felt like Family Guy, with all the cutaways and also with the meth humor and whatnot.